SD technology is more effective than other methods in terms of achieving uniformity and particle size control that are required for drug manufacture. Further, the cost effective performance of this technology is also attractive. We support new drug development of pharmaceutical companies by supplying functional APIs with enhanced properties, developed by our solid dispersion technology and oil into powder conversion technology. 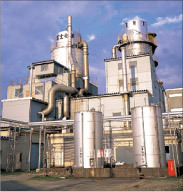 Fuji Chemical possesses two types of SDs: Open-cycle unit, which uses aqueous feed, and closed-cycle unit, which can use both of water and organic solvents. High versatility 1 A majority of solutions, slurry, and emulsion can be spray dried. Improvement of business/production efficiency 4 The scale up from pilot production to commercial production is easy. 5 Continuous mass production is possible. 6 Reduction of number of steps in granulation process from conventional 4–5 to 1 allows high cost performance. 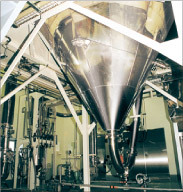 Improvement of stability 8 Spray dryer is suitable for drying thermally unstable drugs.